Enjoys collecting and investing in stock certificates. American Express was originally an express mail business created in Albany, New York, through the 1850 merger of three express competing companies. The founders actually are quite famous today for another company they lent their names too. The three predecessors to American Express were Wells & Company owned by Henry Wells, William Fargo's Livingston, Fargo & Company, and John Warren Butterfield's Wells, Butterfield & Company. If those names look familiar it is because two of the same founders started Wells Fargo & Co. in 1852 when Butterfield and other directors objected to the proposal that American Express extend its operations to California. American Express first established its headquarters in a building at the intersection of Jay Street and Hudson Street in what was later called the TriBeCa section of Manhattan. For years American Express held a virtual monopoly on the movement of express shipments such as goods, securities, and currency throughout New York State. Over time it moved out of the movement of goods and strictly into financial services. In 1882, American Express started its expansion in the area of financial services by launching a money order business in competition with the United States Post Office's money orders. Sometime between 1888 and 1890, J. C. Fargo took a trip to Europe and returned frustrated and infuriated. Even as president of American Express carrying traditional letters of credit, he found it difficult to obtain cash anywhere except in major cities. Fargo asked Marcellus Flemming Berry to create a better solution, which turned out to be the famous American Express Traveler's Cheque. The first AMEX Traveler's Cheques were launched in 1891 in denominations of $10, $20, $50, and $100. By 1903, just over 50 years from it's founding, American Express had assets of some $28 million, making it the second largest financial institution in New York City after the National City Bank of New York. Traveler's cheques established American Express as a truly international company when the 1914, outbreak of World War I, found Americans stranded in Europe unable to access letters of credit except through American Express offices and a few other banks. Today American Express is a large credit card issuer, lender, travel agent, travelers cheque issuer, financial adviser and participant in a number of related businesses. AMEX issues its charge and credit cards in countries around the globe, either on its own or as co-branded cards with partnering institutions which also support merchants that agree to accept American Express cards. In most markets similar groups of privileges and rewards are offered on cards to cardholders. As of December 31, 2010, American Express had more than 1,500 redemption partners across its international business, with an average of approximately 84 partners in each country and approximately 30% of these partners are in the travel industry. Card holder redemption options usually include travel, retail merchandise, entertainment, shopping and recreation gift certificates, experiences, financial services and charity rewards. Because AMEX is a financial services business there are no real physical products produced (other then cards and paper) so unlike the vast range of Ford Motor Company branded gifts, the American Express fan has fewer choices. Here are some options. Many Monopoly game editions have been released, including an Monopoly American Express version. It is collectible and sells at a premium to the original issue price. 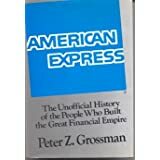 Several hardcover books have been published on including American Express: The Unofficial History of the People Who Built the Great Financial Empire by Peter Z. Grossman. An online review at Amazon states that financial journalist, "Grossman does a thorough job of following "Amexco" from its beginnings in the 1840s as a package carrier to the international travel, insurance, banking, brokerage and financial services colossus it has become, with travelers checks (since 1895) and a charge card known the world over. His work is well-documented history is conscientious, even tedious at times, but there is plenty of excitement in such things as corporate infighting, war and Depression crises, takeover attempts and a "scandal" in which AMEX indirectly backed nonexistent collateral for commercial loans. American Express survives and prospers, this narrative makes clear, on income derived from "the float"money paid for travelers checks and made use of by the company for investment until the checks are cashed weeks or months later and sometimes never." Perhaps one of the coolest gifts related to a financial services company is American Express itself. You can give an actual registered share of American Express stock to your loved one or friend. The single share will the owner's name listed as a registered shareholder and it is signed electronically by company officers. The shares can be framed in a variety of styles, and if you want a little custom plaque can be added below the certificate. They make a completely unique piece of art to hang on an office wall. Stock is the gift that keeps on giving. As a registered shareholder, your American Express company enthusiast will get Annual Company Reports and dividend checks quarterly. They can vote on company business by mail, online or even attend the annual general meeting as a duly registered shareholder. Also as a registered shareholder of American Express they can join the dividend reinvestment and stock purchase program which is a good way to increase their stock holdings. OneShare offers American Express single shares for the market value of the actual share, a transfer fee, and the frame, plaque and shipping cost. In 2011, Wells Fargo was the 23rd largest company in the USA. Wells Fargo is headquartered in San Francisco, California, but has major "hubquarters" in other cities as well. Wells Fargo Bank, N.A., with its main office as Sioux Falls, South Dakota. is the primary operating bank in the group. AMEX sent me one of those black cards. Is it good for anything? A black Amex credit card or something else?